The burger has lost to empanada in Bolivia. 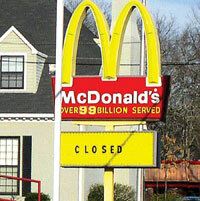 Fourteen years after it began operations in the country, McDonald’s served its last hamburgers in Bolivia on December 24. Bolivia becomes the only Latin American nation without a McDonald’s. The closure was on the anvil for a few months. In October last year, the company’s marketing staff produced a documentary, Why did McDonald’s Bolivia go Bankrupt, trying to explain why the Bolivians never crossed over from the stuffed bread, empanada, to Big Mac. The documentary includes interviews with cooks, sociologists, nutritionists and educators who all seem to agree that Bolivians are not against hamburgers per sé, just against “fast food”, a concept widely unaccepted in the Bolivian community. One commentator interview in the film said, “The food has to be prepared with love, dedication, certain hygiene standards and proper cooking time—hardly the virtues that a fast food vendor with imperialistic aspirations is instilled with, at least in a nation that has by now taken a solid stance against what it perceives to be the meddling and cynical aspirations of American entities”. This is indeed heartening.. More countries should follow this. A very refreshing piece of news in a world hopelessly dominated by western corporate aspirations. Latin America was one of the first regions to suffer the new-age experimentation at the hands of the US in the post-colonial, post WW-II era of the 1950s. It is easy to see their rationale behind being averse to everything American, and when such a lack of ambivalence helps preserve your own culture then this disenchantment with the west is a positive channel for disbursement of vexation. We, or more precisely, our "instant-gratification-loving" 'y' generation should be listening, or else, we are just helping the western powers create a substitute for colonialism here in our own backyard.